Boy, was this year a scorcher! Well, what can I say, apart from: get ready for more! According to an exclusive info ran by New Scientist, all but one main tracker of global surface temperature will report that this year will mark the first full degree Celsius above pre-industrial levels. I remind you that the International Panel on Climate Change warns that a two degree Celsius warming should be avoided on all costs if irreversible consequences like sea level rise, habitat loss, and cataclysmic events are to be averted. This means that we’re already halfway there, and the two-degree mark might be reached by 2050. A four-degree warming might end civilization as we know it. This might not be the only negative milestone for this year, as far as the planet’s climate is concerned at least. This year could also mark the end of the warming hiatus, often thrown about by global warming skeptics. 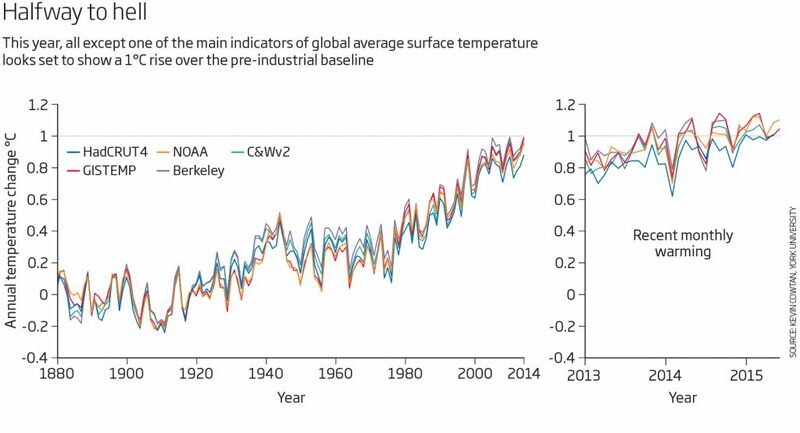 Between 1998 and 2012, average surface temperatures have only risen by 0.04 degrees Celsius. Well, that settles is right? Wrong. If you don’t know history, it’s like being born yesterday. Everything seems the same. Between 1984 and 1998, the world warmed by 0.26 °C. A similar jump was registered from 1910 to 1920 or 1930 and 1940. The decade ahead might see a similar accelerated warming. For more, check out global warming hiatus explains previously here and here.